There are lots of programs you can use to keep your personal files and folders private, but can you be sure they’re 100 percent secure and don’t have any hidden backdoors to worry about? The diskAshur Pro 2 range of portable USB hard drives takes this worry away because they offer PIN authenticated XTS-AES 256-bit hardware encryption, and are fully tamper-proof/tamper evident. Unlocking the drive is just a matter of tapping your PIN into the large keypad and then pressing the unlock button. To secure it again, just press the lock button, or eject the drive. They also automatically lock themselves after a period of inactivity. A row of three LEDs above the keypad show the drive’s status -- red is locked, green is unlocked, and blue is admin mode. The drive is protected using EDGE (Enhanced Dual Generating Encryption) technology -- a dedicated hardware based secure microprocessor (Common Criteria EAL4+ ready) -- with built-in physical protection mechanisms that encrypts both the data and the encryption key. They come with an integrated USB 3.1 cable which tucks into the side. It’s quite a short cable, which is one of the only downsides. If you want to use it further away from your computer you might need to consider an extension cable, but in most instances you’ll be fine. There’s a desk lock/slot connection on the side of the drive so you can attach it to something should you wish to. Inside the box is the drive itself, which measures just 124 mm (W) x 84 (D) mm x 20 mm (H), a well-made carry case, and the user guide. You also get two free optional programs you can download. These are iStorage DriveSecurity (powered by ESET NOD32 antivirus software) and Nero BackItUp. The only thing included on the drive itself is the manual in PDF format. The first thing you’ll want to do is change the default PIN. To do this, hold down the unlock and number 1 buttons, enter the current PIN, and press unlock. This will put you into admin mode. Hold down unlock and the number 2 button, and enter the new PIN, followed by unlock. Reenter the PIN a second time, and press unlock, then press lock. The PIN will have changed. For security reasons, there are several PIN requirements. They must be a minimum of 7 digits and a maximum of 15 digits, not contain all sequential numbers (no 1234567) or all repeating numbers (3333333). The alphanumeric keyboard lets you lock the device by spelling out words, and a shift key allows you to make the PIN even harder to guess. In addition to the admin PIN, you can add a user PIN. To unlock the drive with this, you need to press the unlock button, enter the PIN, and then press on unlock again. The keys are wear resistant epoxy coated to prevent the most frequently used digits from being revealed. The diskAshur Pro 2 drives are protected with a brute force hack defense mechanism, so after 15 consecutive incorrect PIN entries, the drive will delete the encryption key and lock itself. After this point, the only available option is to reset to factory default and start over. In addition, a self-destruct feature lets users pre-program the drive with a PIN which, once entered, instantly deletes the encryption key, killing access to the drive’s contents. All very James Bond. Just don’t confuse your admin PIN with the self-destruct one. The drives are very well made, water and dust resistant (IP 56 certified) and come in the Classified graphite color you see in the photos. 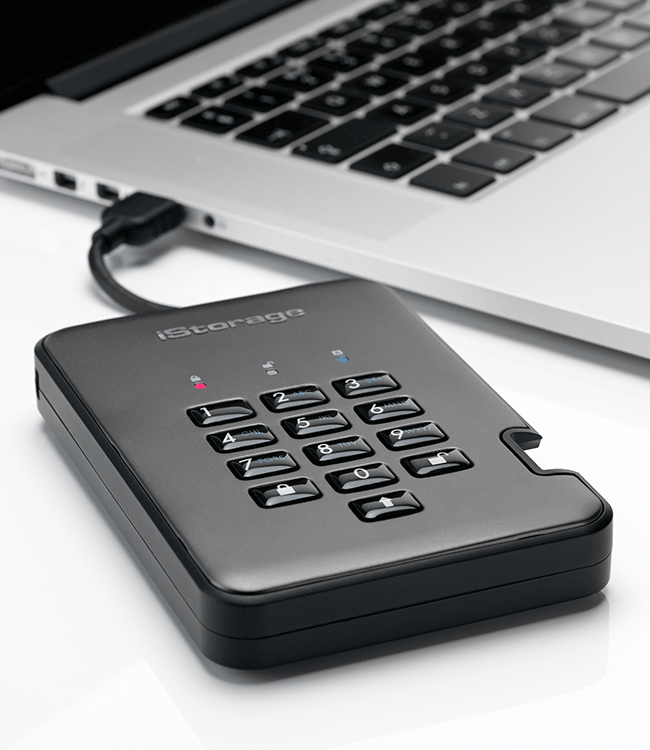 The hard drives are available in 500GB, 1TB and 2TB capacities, and priced from £209/$268. There are also SSD versions available in 128MB, 256MB, 512MB and 1TB sizes, with prices starting at £189/$241. 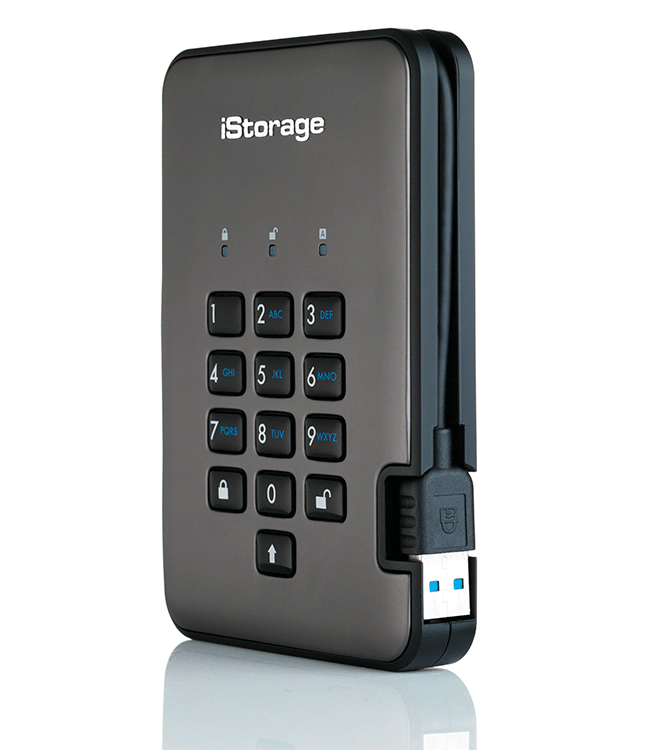 You can buy both directly from iStorage, or Amazon. If you’re looking for a very secure solution to prevent your personal data falling into the wrong hands, then the diskAshur Pro 2 range of portable USB drives will suit your needs perfectly. Weight max. 225 grams approx. 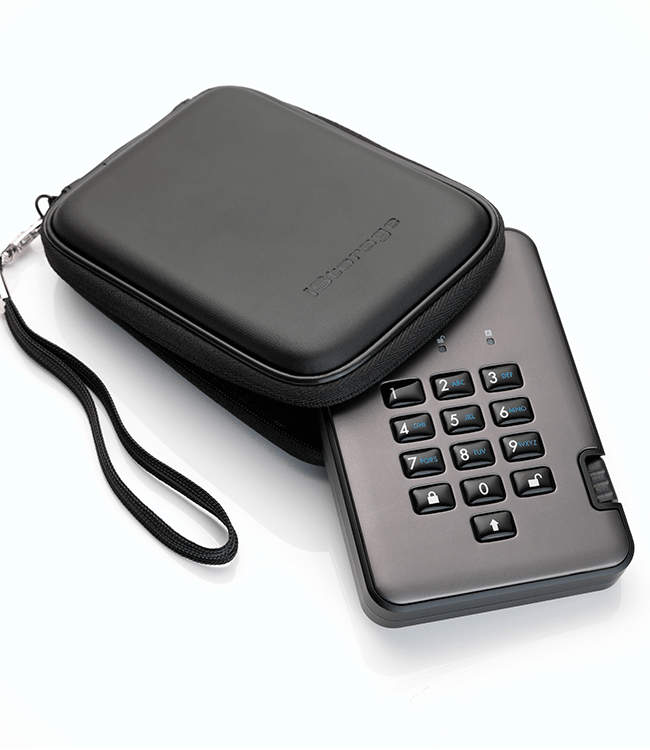 The same company also sells secure USB flash drives with a built-in keypad that work in the same way. These cost from £69/$88 for an 8GB drive.